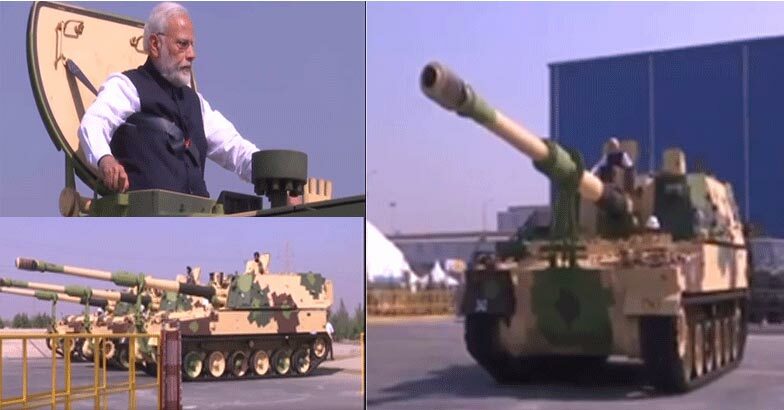 PM Narendra Modi rides a K-9 Vajra self propelled Howitzer ,today. The Indian made warfare vehicle was built based on the K9 Thunder of South Korea.The new self propelled Howitzer can shoot in a range of 30 to 38 km and can continuously make rapid fire thrice in a second when put in burst mode. Vajra can also make fire of 15 rounds in intrance mode,and 30 rounds in sustained mode. The new Howitzer riffle comes under the NATO rules but can oversee the attacks in mountain ranges and are helpful for warfare.